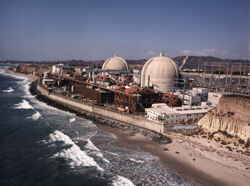 October 20, 2012 (Washington D.C.) -- Citizens' Oversight, an El Cajon-based citizens watchdog group, submitted a formal request to the U.S. Nuclear Regulatory Commission (NRC) regarding a license amendment request by Southern California Edison (SCE) for the San Onofre Nuclear Generating Station (San Onofre). May 27, 2012 (Sacramento) — A measure by Assemblymember Marty Block (AD-78) to help military veterans gain academic credit for their military experience passed the Assembly today on a vote of 67-0. April 21, 2012 (San Diego’s East County) –“Every once in a while, government does something that is not only good news, but refreshing,” local author and former public radio producer Walter Carlin said of last month’s decision by the Federal Communications Commission (FCC) to open the airwaves up for community radio stations, rather than reserving that space for mega-networks with concentrated ownership and opinion-shaping power. April 11, 2012 (San Diego) -- Purchasing a large investment such as a home can be a stressful experience. There can be multiple parties involved to ensure a smooth transaction during the buying process. Real estate agents, loan officers, escrow representatives, appraisers, and home inspectors all play a significant role in accomplishing one goal: Closing the purchase on your house. June 19, 2011 (LaMesa) --The La Mesa Police Department conducted a Court Sting Operation at the East County branch of the San Diego Superior Court on Thursday, June 16, 2011. Our main focus was to identify those drivers who continue to drive even after having their license suspended as the result of a prior DUI arrest. The detail was operational for about two and a half hours. In the end, 10 subjects were contacted and 8 of them were found to be driving on a suspended or revoked license. All of them were issued a citation and their cars were impounded and then placed on a hold due to the driver having a suspended license.